Little space heroes evade a space pirate trying to get their treasure map; and a teenage boy and his dog transform into a biblically inspired superhero and a lion to face evil. 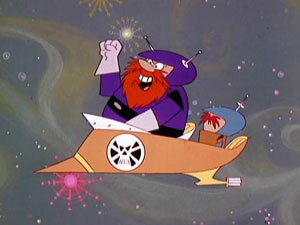 As we have mentioned in past reviews, 1966 is considered the beginning of the golden age for Saturday morning cartoons. This season saw the debuts of The Adventures Of Superman and Space Ghost, as well as reruns of Looney Tunes shorts and former Hanna-Barbera primetime shows. Perusing a list of shows on television that year reveals many old favorites, but there are also a number of oddities and surprises. 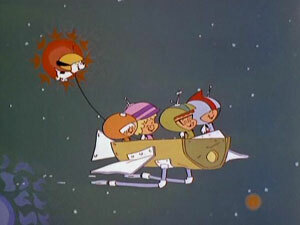 One of the more obscure programs would be Space Kidettes, a show chronicling the adventures of four small children in outer space. 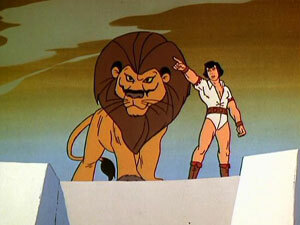 The following year saw the debut of Young Samson And Goliath, about a teenager who changes into a sort of full-grown superhero, while his dog transforms into a lion. 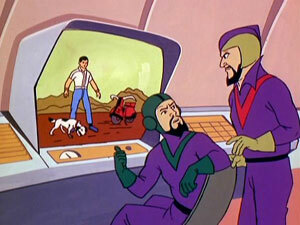 Neither show seems to have been a hit, but Hanna-Barbera still got some further use out of them. According to information provided by Warner Archive, each show was designed to be broken up into segments, alternating with other animated material not produced by Hanna-Barbera (but controlled by the series’ sponsor). 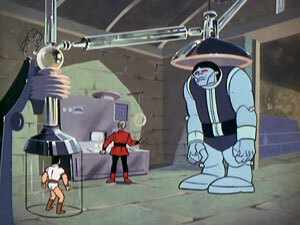 Later, the two shows were instead combined into The Space Kidettes/Young Samson for other use on Saturday morning or in syndication. The original formats of the shows have been lost forever, as the original negatives were cut and edited when the shows were reformatted. It is the resulting syndicated version of the combined show that survives for this DVD release. In this version, each segment gets its own opening sequence and end credits, so it’s like watching two consecutive ten-minute shows. This is one of those Hanna-Barbera Classic Collection releases that I looked forward to simply to revel in the obscurity of its subject. While this show may have been seen on cable in recent years, this four-disc release of the twenty episodes is practically my first experience with it, outside of the single episode found on the second volume of Warner’s Saturday Morning Cartoon Collection – The 1960s. I’m always up for some classic Hanna-Barbera cartoons, and it’s a real treat to experience ones I’ve never seen before. 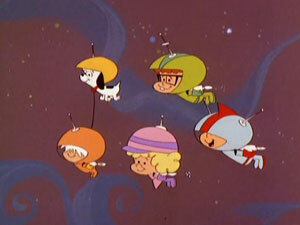 The Space Kidettes features four youngsters, named Scooter, Jenny, Snoopy and Countdown (and their dog Pupstar), who travel through space solving all manner of problems. 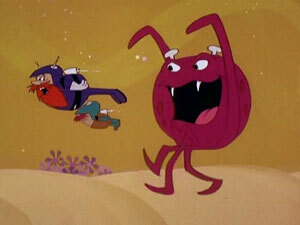 A space pirate named Captain Skyhook, who is constantly trying to get their treasure map, causes most of those problems; but there is also an assortment of bizarre monsters and various aliens with whom they come into conflict. The animation is top quality stuff for its time (all things considered), up to the standards of The Jetsons or Space Ghost. There is a visual richness to the show that makes it a delight to watch, even if the stories are of the cute and simple variety. The four kids all have the same basic personality, though Countdown is obviously the brains of the outfit, while Jenny… well, she sounds like Judy Jetson. While obviously aimed at kids, I still found I could enjoy it by appreciating the visuals and the usual top quality Hanna-Barbera voices— Don Messick, Daws Butler, and Janet Waldo. Young Samson, meanwhile, aims slightly older in its stories of mad scientists and ancient civilizations. 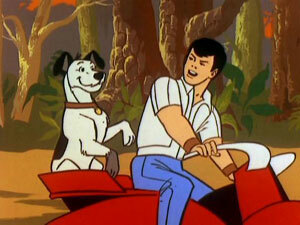 Samson starts every episode as a teenage boy, riding on a scooter with his dog Goliath. He always seems to be chasing down a scientist friend of his, or bumping into the military, or encountering weird threats. Once he is endangered by that episode’s pointy-eared menace, he bangs his magic bracelets together to transform into an older but still young man, with powers of flight and super strength. He eventually finds he also needs help from his dog, which he can change into a lion that shoots power beams from his eyes. Together, they defeat that week’s monster, giant robot, or aliens. The stories are simple but fun. It is unfortunate that Young Samson does not impress quite so much visually. The design of the main character is not as appealing, and the backgrounds are frequently less detailed than those seen in Space Kidettes. I also found myself yearning for more of an origin tale to explain how this boy acquired his magical bracelets. Aside from that, the drawing for the show generally seems less sophisticated too, leaving me the impression I was watching something more akin to Mighty Hercules than a Hanna-Barbera production. Still, the show is loopy enough in its premise and enthusiastic enough in its execution that I could enjoy it. It fits in well with the era that spawned shows like Birdman And The Galaxy Trio. 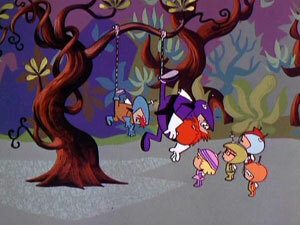 There is something about the innocence and simplicity of 1960s Hanna-Barbera that I find endlessly appealing. Having never thought I would ever see either of these shows get their own DVD sets, I found myself very pleased to be holding such a set in my hands. No extras are included. The menu offers the choice to play all, or to select from a list of episodes; or, you may choose to play all episodes of a single show. 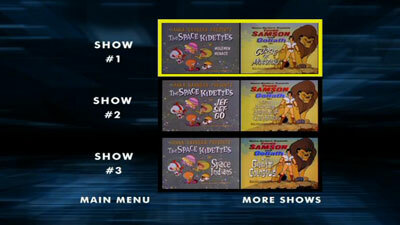 On the episodes menu, each episode displays its two title cards (one for each series) for easy reference. The four DVD-R discs come in a standard-sized clear keepcase with swinging trays— no overlapping discs. The discs do not contain episode information, aside from episode numbers (no titles). The numerous blemishes in the image, particularly on Space Kidettes, serve to add some nostalgic charm more than they damage one’s enjoyment. Fading in the prints is minimal, and there is a small amount of dot crawl at times. Overall, I found the video to be satisfactory. The mono sound, in English only, is clear and consistently fine. No subtitles are available. While there are a number of shows I’d rather have seen Warner Archive get to before debuting this combined series, it is actually pretty cool that such an obscure program can get a DVD release these days, even as part of a manufacture-on-demand program. The stories are very slight, having been aimed at small children, but one can still appreciate the charms of such fanciful plots. 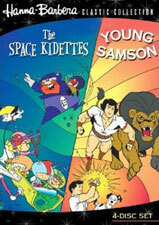 Space Kidettes is better in the art and voice department, while Young Samson has better stories for more serious viewers. If you have a fondness for old-school Saturday morning cartoons, and enjoy discovering little-seen shows, then these could be what you’re looking for.